This tapestry, entitled Les Bateaus, or its entire name of "Les Bateaux sur la Plage de Saints-Marie" shows a series of ships on the beach of St Marie. Van Gogh's rendition of the ships on the beach shows his characteristics of his art which included the sense of motion and aliveness which accompanies his works as a direct relation to the way he painted. The sand and the sky seem to move and contributes to the atmosphere in all his unmistakable pieces. 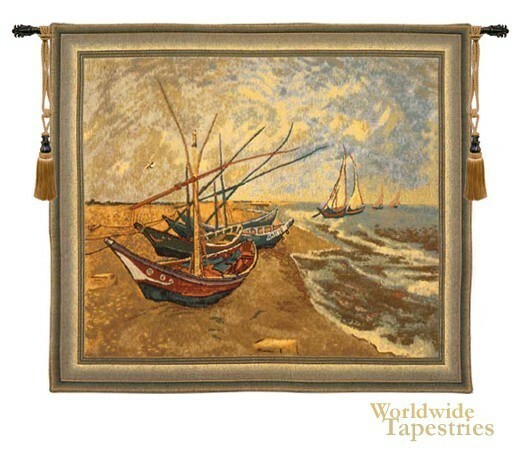 Van Gogh Les Bateaux tapestry is backed with lining and has a tunnel for easy hanging. Note: tapestry rod and tassels, where pictured, are not included in the price.